Trekkie Alert! (If you don’t know what that means, then maybe this isn’t the slot for you.) The Star Trek Red Alert Slot brings the crew of the Starship Enterprise to the casino. It doesn’t get any better when an online slot machine contains a picture of William Shatner in his prime. Spin the reels for a chance to access the multiple Bonus Features that award lots of Free Spins and Multipliers. Join Captain Kirk, Mr. Spock, and Dr. Leonard “Bones” McCoy for a space adventure through the final frontier with the Star Trek Red Alert Slot. This video slot caters to fans of the classic television show or at least lovers of science fiction. The graphics include photos and clips that pay homage to the television program about a crew flying spaceship. The Star Trek Red Alert Slot Bonuses include a Red Alert feature which gives an unlimited number of Free Spins. In addition the game contains several additional bonuses that ensure lots of big payouts. It doesn’t get any nerdier than the Star Trek Red Alert Slot, and we love it! The reels contain all the beloved characters of this classic television show including William Shatner as Captain Kirk and Leonard Nimoy as Mr. Spock. Then you can enjoy all the futuristic gadgets and gizmos along with images from outer space. WMS Gaming software developed this game which provides an exciting theme with retro, sci-fi graphics. The Star Trek Red Alert Slot offers several different Bonus Features that award Free Spins and Multipliers. The Bonuses to Infinity and Beyond! 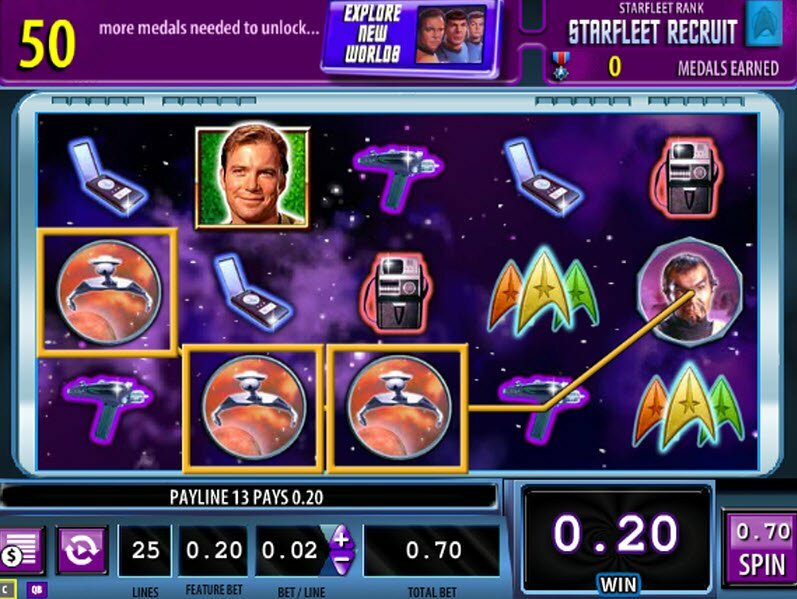 The Star Trek Red Alert Slot Game comes bursting with bonuses. First of all, the game contains a handful of Bonus Features along with a maximum jackpot payout of £45,000. We’ve provided a guide about each bonus below. The Star Trek Red Alert Slot offers several different Bonus Features that award Free Spins and Multipliers. During the Rock Create Multiplying Wild feature awards a multiplying random throughout the reels with a value between X3 and X10. The Scotty’s Wild Reel Feature fills 1 or 2 reels entirely with Wilds, making it almost impossible not to win. 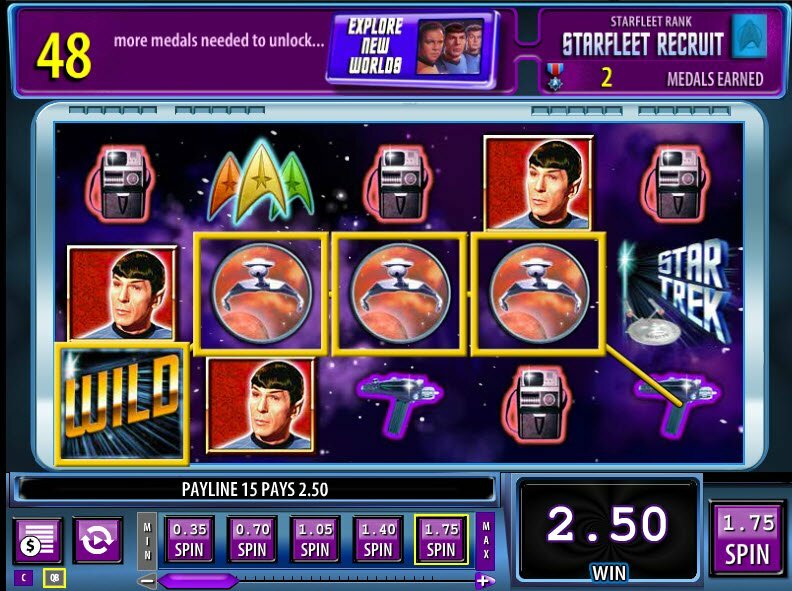 When The Spock Multiplier appears on the reels, paylines multiply X3 and X10. Finally, during the Enterprise Fly-by Feature, the Starship Enterprise flies past the screen changing winning combinations so that they pay out even more. When the feature symbol appears 3 or more times on the reels, the game enters the Red Alert feature. This Bonus Game grants you a medal as well as an unlimited number of Free Spins. During each Free Spin, you receive a multiplier of up to X15. For each Free Spin that doesn’t win, you lose a shield. After you lose 5 shields, the Red Alert Free Spins end. If you get 3 or more shields, the game resets back to 5 shields. Kind of confusing, huh? 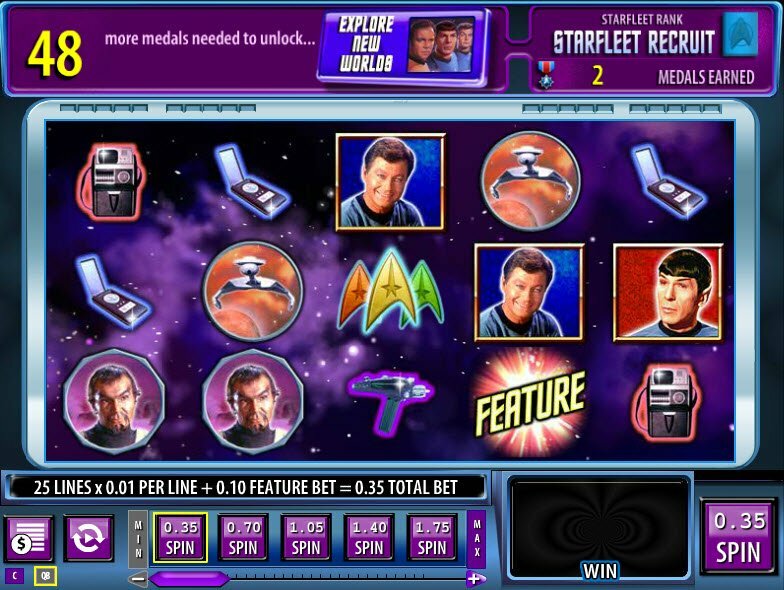 Well, the bottom line is that the Star Trek Red Alert Slot Bonuses keep on coming!